Jim Huether is someone who’s been around the gaming industry since its inception. As one of the Atari originals, he was part of the incredible think tank that came up with many great hits for the 2600 and 5200 consoles, such as RealSports Football and Xevious. From the late 1970s to the early 1980s, Huether put together an impressive list of titles, some of which were never released and are now highly sought out by collectors. He was the last of the original twelve Atari programmers to leave. After Atari was sold off, he went to work for Epyx and eventually Sega, where he was responsible for the development of several classic games and peripherals. Currently, Huether is a sr. program and project manager for development of consumer software and electronics products. He also runs a business and life coaching company called Coach to Action. Recently, Sega-16 had a chance to chat with Mr. Huether about his time at Sega. Sega-16: After such a storied history at Atari, how did you find yourself at Sega? Jim Huether: Atari basically hit bottom when Jack Tramiel bought it in mid 1984. I got out with a good severance package just before that. Myself and two other engineers from Atari (Jim Andreasen and Eric Manghise) started our own company Advantage Software, developing edutainment software for the Commodore 64. We funded it ourselves, and almost licensed some titles to Epyx, EA and Spinnaker. However, 1985 was the year that the Commodore took a dive, so all the publishers cut way back on third party titles, and the licensing of our products never happened. We ran out of funding, and so we went back and got “real” jobs. Eventually in 1988, I got hired by Epyx to be a Project Manager for game development. I was Project Manager for all of the Sporting News Baseball games, some of the Street Sports line of games, and for California Games II and Cartoon Maker. I was promoted to Sr. Producer, but then Epyx fell apart, largely due to a bad deal they entered into with Jack Tramiel from Atari. Some friends of mine got jobs at Sega (Hugh Bowen, Clyde Grossman and Ken Balthaser Sr.) and they needed a good Sports Producer, so I got hired on there as Sr. Producer. Sega-16: The original Joe Montana Football was done by Electronic Arts, and Trip Hawkins recently told us that Sega didn’t approach him with the series again. When and how did you come aboard? Jim Huether: That’s not exactly true. I was working with three separate groups to develop Joe Montana Football, using a horizontal approach so that more of the field would be visible (similar to the 5200 RealSports Football game I designed and developed at Atari). However all three outside groups, including Mediagenic, were having trouble getting the job done right and on time. We received an early copy of EA’s Madden Football, and decided maybe we could contract with them to use their engine and get a game out for Joe Montana Football on time. We did this with Trip Hawkins, but we set rules for how the two games would be different, such as graphics, features, game tuning, etc. So while we did use EA’s engine, Sega made modifications to differentiate the game and make it more QB-appropriate for Joe. We did not approach EA for future football games, because we finally found a team who could do a horizontally oriented game. I drove the initial design of the second Joe Montana game, and designed it such that all receivers would always be visible on the field, except for Hail Mary plays. I was then pulled off the project to handle other duties and the game development was handed off to another producer. Some of the basic fundamentals of the design were changed before its release. Sega-16: The first game scrolled vertically, though early Sega advertisements showed a horizontal engine. Why did you decide to change? Jim Huether: As I mentioned before, we were developing a horizontal scrolling game, but for numerous reasons, we were not getting success and went for the vertical scrolling engine from EA. In our early PR releases, we showed shots of the horizontal games we had under development, before we had to make the change. Sega-16: Whose idea was it to include the now-legendary play-by-play commentary in the sequel? Jim Huether: I don’t recall whose idea this was originally, but Sega found a speech technology that would work, and the play-by-play developed from that. It was a very novel addition to a game for that era. Sega-16: How difficult was it to include all that speech into such a limited amount of memory? Jim Huether: The Genesis had good sound capability for its day, and the technology that Sega licensed was designed very efficiently for it. We also had a few very good audio engineers at our disposal to make it all work. Sega-16: Did you have a part in the Sports Talk Baseball game as well? Jim Huether: No, I had no real involvement in the baseball game for the Genesis, though I did propose the catcher view and the spinning ball for the first Sega Saturn baseball game. Sega-16: Let’s switch over to Castle of Illusion, one of my all-time favorites. It’s been hailed as one of the best Mickey Mouse games ever made, and it has aged wonderfully. At the time, did you get that “we nailed it!” sort of feeling, in regards to the character? Jim Huether: Thanks. I am very proud of that game. Yes, when we released it, I knew we had a winner. Disney, Sega Japan, and I worked very closely on this game. I am personally very proud of the intro or easy level. That was my idea so that parents could play with their very young children, and both would be able to play the game and get some rewards very easily. Sega-16: How closely was Disney involved? We know that it is very protective of its licenses and was against the idea of Mickey having “lives,” so to speak, and insisted that he not die (hence the term “tries” instead). Did Disney’s producer, Stephan Butler lay down any other restrictions? Jim Huether: Disney had very strict rules, so we did use the term “tries” instead of lives. 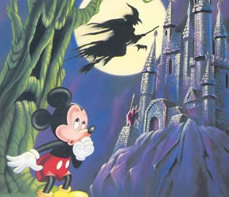 Stephan Butler and the higher-ups at Disney did lay down some other strict rules, one being that Mickey could not do certain things as Mickey, but that he COULD have more freedom playing a character, such as Sorcerers Apprentice. That allowed us to do things in the game that Mickey, as Mickey, would not be allowed to do. In working closely with Stephan, we were able to find compromises that Disney would agree on, in order to make a good game and still not violate Disney’s key rules. Sega-16: You are mentioned in the game’s end credits, along with many pseudonyms for Japanese staff members. There’s been some confusion as to how much Sega of America was involved in Castle of Illusion’s development. Could you clarify this for us? Jim Huether: I believe I was credited as “Jim Hi Master” in the original, because Sega didn’t believe in giving real name credit back then. I was the producer of the game for the Genesis, Master System, and Game Gear. The development team was in Japan, but it was not developed for Japan and localized for the U.S. I assure you that myself and Stephan at Disney drove the design of this game and approved the final versions. Sega-16: The second room in Castle of Illusion features that awesome stage that forces gamers to turn things upside down. Where did this idea originate? Were there any other cool ideas or effects that didn’t make it into the final game? Jim Huether: I honestly don’t recall who came up with the upside down idea, but it was a good one. There were lots of other cool ideas that didn’t make it into the game, either because Disney did not like them, or because they were too difficult to actually do, or because we had better ideas that DID make it into the game. Sega-16: Many people have criticized the game for having the standard “hop-‘n-bop” gameplay made popular by hits like Super Mario Bros. Do you think this is an unfair assessment? Jim Huether: This was an action adventure game. Super Mario Bros. did not invent this genre. We used techniques used in those games and others, as well as new ideas, so of course it’s an unfair assessment. Sega-16: Later Mickey Mouse games, such as Fantasia and World of Illusion, never quite measured up to Castle. In fact, few Disney games since have done the famous mouse justice. Why do you think this is? Jim Huether: Those games didn’t have me driving the product. Seriously, we had a good team at Sega and Disney, who even though we got off to a rocky start, pulled together and had a shared vision and made the best game we could. It ended up being a great team effort. Sega-16: What did you think of Sega’s other Disney hit of the era, Quackshot Starring Donald Duck? Jim Huether: I didn’t play that game much, but from what I did, it seemed like a fun and cute game. Sega-16: Why did you leave Sega? Any special memories you’d like to share with us? Jim Huether: After being Sr. producer there for a while, I was asked to take over the developer support function which I did. I spent a lot of time qualifying new third party developers for Sega, and managed the development of the GEMS sound development tool. We put together a team consisting of a musician, and audio engineer, and a top-notch programmer. We used the GEMS tool in-house and with select third party developers until we had a tool that essentially met everyone’s needs. It was one of the few tools I’ve ever known about that got way more praise from its users than complaints. Then Sega asked me to start a new peripherals group at Sega of America. Peripherals had always been developed by Sega of Japan or their third parties, but they wanted new peripherals especially designed for the American and European markets. So I started the group and created processes and policies for how these new peripherals would get developed and integrated with game software development, early prototype testing, marketing, manufacturing and combined releases with game titles. After a while I was promoted to Director of New Product Engineering. This group and I were responsible for such products as the Genesis IR controller, the multi-player adapter, the Activator, and the Sega Powerstrip (which had room for five AC adapters to be plugged in). For the Sega Saturn, we were responsible for the Saturn Mission Stick, the re-design of the Arcade Racer steering wheel, the multi-player Team Player adapter, and other devices. We also were responsible for the hardware and firmware parts of the Cartdev development system for game developers. In 1995, Sega of Japan decided to move all peripheral device design and development back to Japan, and only allow us to find and forward new technologies for new I/O devices to them. At about the same time, they decided to spin off Sega of America’s Product Development group to SegaSoft. I moved there as Director of New Technology Development and was chartered to come up with new platforms for content delivery and use via the internet. We came up with a number of interesting devices such as the stand-alone internet radio box, internet gaming and information platforms, and wrote the original white paper for the Sega Dreamcast. We also did the original top-level design for the Dreamcast. Then Sega of Japan took over the rest of the design for the Dreamcast and modified it. In addition, SegaSoft realized it was primarily a software company, and needed to spend all of its funds on software. So the New Technology Development group was disbanded and we were all laid off. Many thanks to Mr. Huether for taking the time for this interview.